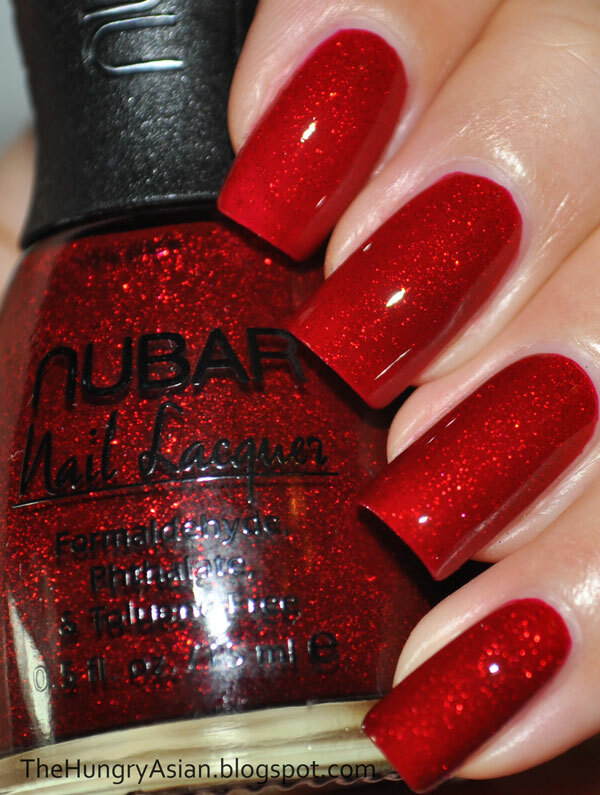 Nubar's Holiday Jewel Basket is a sparkly 9 piece set that also includes a basecoat and quicky dry topcoat. I pulled the trigger on this prematurely while I was editing aaah sorry about that. The publish post and save now buttons are too close! Silver Glitter 2 coats with Seche Vite topcoat. This is very opaque and sparkly and the glitter is a steel grey silver. Gold Glitter 2 coats with Diamont topcoat. This doesn't suit my skintone but it is quite beautiful. 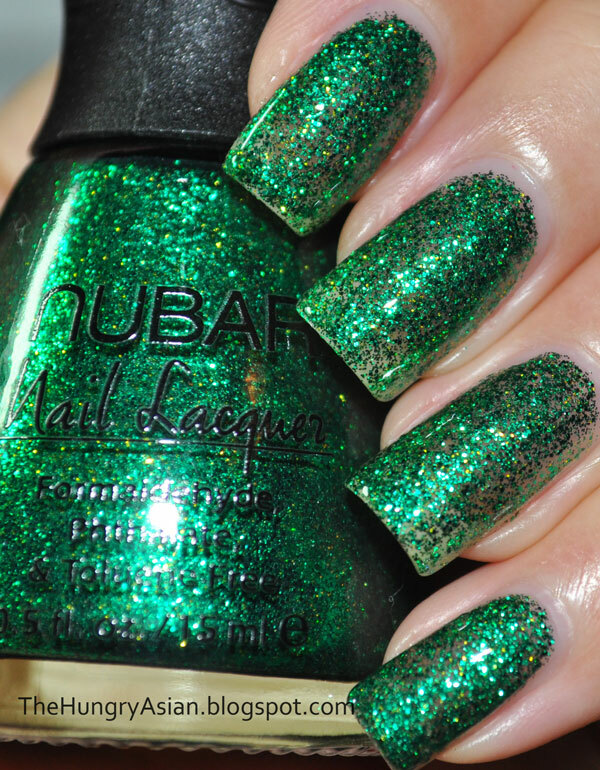 Grass Green Glitter 3 coats with Diamont topcoat. Fine pieces of green glitter in a clear base, it also has some golden glitter here and there so it gives it a nice sparkle. This was thin and patchy on me I had to go back and apply extra on my tips after my 3rd coat. Competition Red 2 coats with Seche Vite topcoat. A bright red creme. Ruby Red Glitz 3 coats with Seche Vite topcoat. Small red glitter is in a red base. 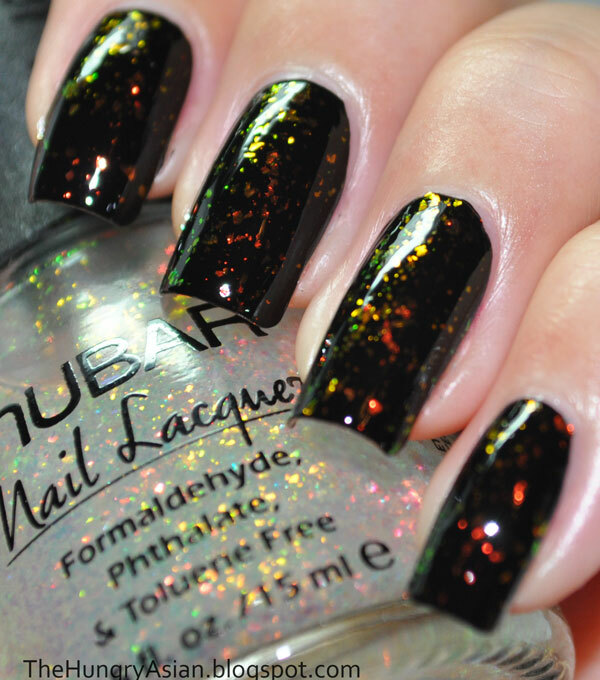 The glitter sparkles and looks suspended in your nails, absolutely stunning. 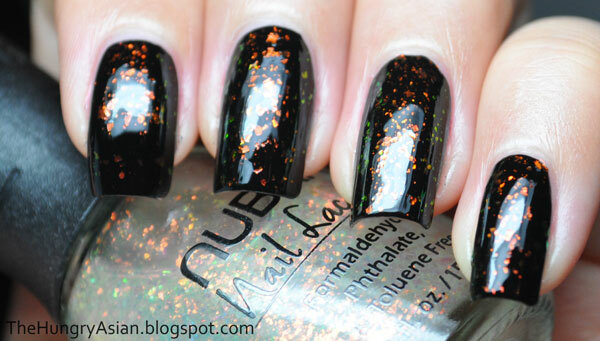 In the bottle, it looked similiar to Fire Sparkle but on the nail it is completely different. Fire Sparkle is packed with glitter in a orangey red base and is very gritty while Ruby Red Glitz's glitter is sparse and more of a true red. 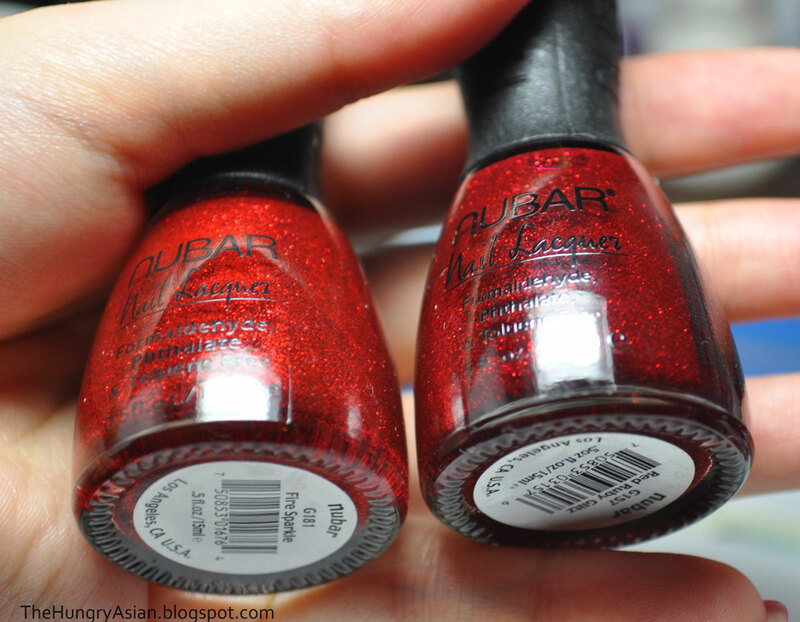 This is more of a dupe for China Glaze's Ruby Pumps. Let me know if you would like me to do a comparison of Ruby Pumps. Click to enlarge to see the difference! Pixie Dust 2 coats over a black creme with Seche Vite topcoat. 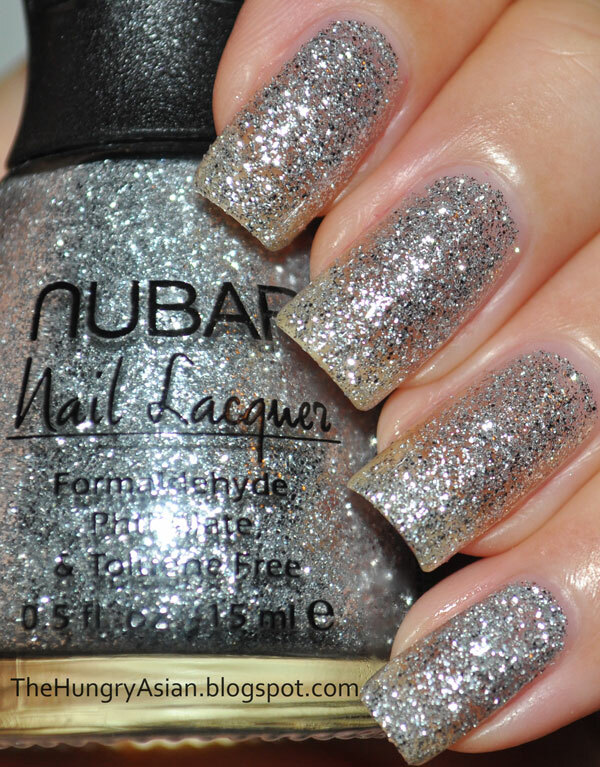 The glitter in the bottle looks so ethereal, but on the nail it is very subtle. I had applied this over Competition Red but it didn't photograph well so I tried it over black. It's very pretty if you want to give your mani a little extra sparkle. 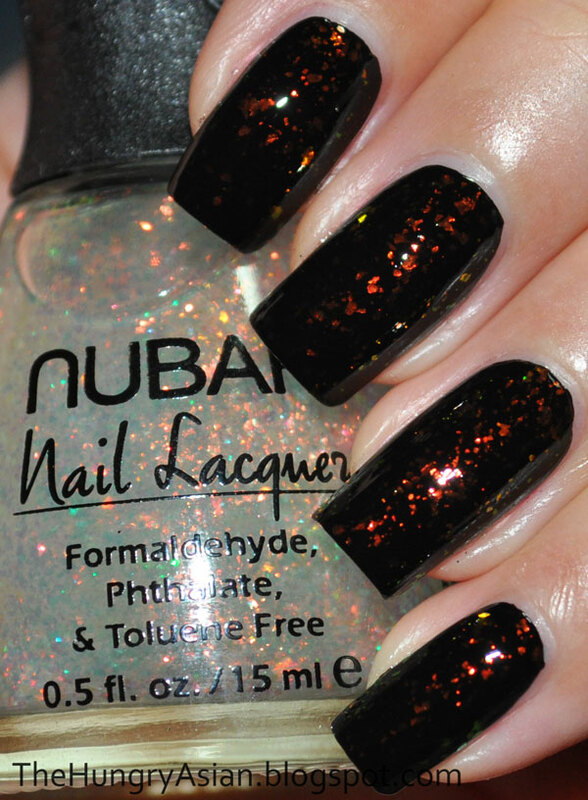 Nubar 2010 1 coat over a black creme with Seche Vite topcoat. I never got the dupe Sally Hansen Hidden Treasure so I can't wait to try this over different colors. I love the way the flakes change colors I did this last so I could have a full manicure lol. Now I have to mention something about Diamont, the quick dry topcoat that comes in this set. I made an order several months ago and decided to try Diamont for the first time, which I thought was great. It went right to the top of my list with Seche Vite. I opened up the Diamont that came in this set not knowing if it was the new formula that I've been reading about, but I smelled it and immediately knew it was different. The old formula has a pretty distinct scent (to me smelled like melting rubber!). I tried the new one with the 2010 mani above and 10 mins later, it was tacky and left fingerprints. 10 minutes is an eternity for a quick dry like the old Diamont. It was late so after 15 minutes and it was still not dry at all, I put a coat of Seche Vite and called it a night. I don't know why the formula was changed but the new Diamont is very disappointing and does not dry at all. 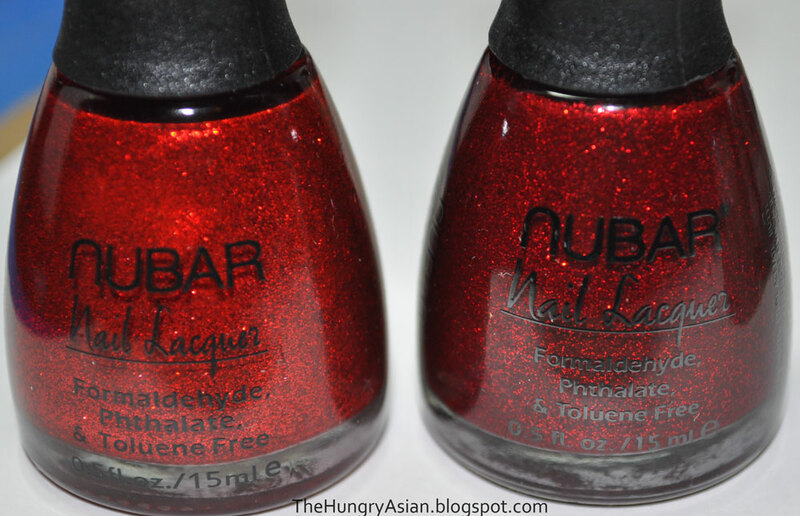 Nubar please bring back the old formula or fix the new one! This set goes on sale at bynubar.com on November 15th for $49.95, which is an awesome deal. 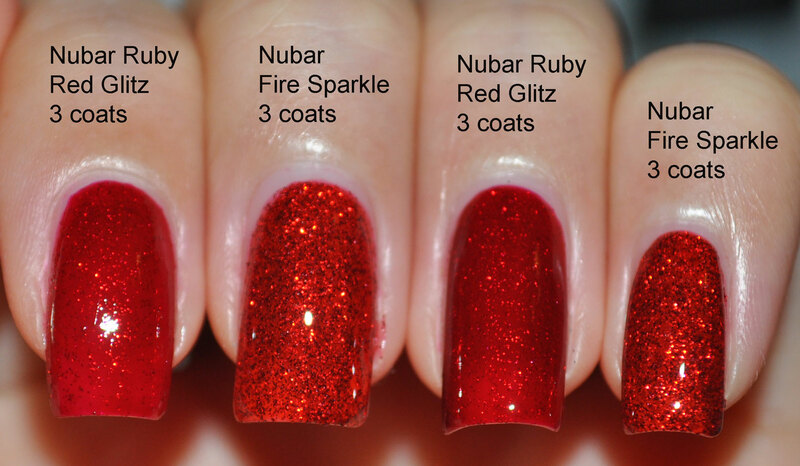 I think Nubar makes really great glitters, even the red creme is gorgeous! All the glitters except for Grass Green Glitter (too thin) had the right consistency and opacity. The formula was fantastic, the creme applied perfectly. 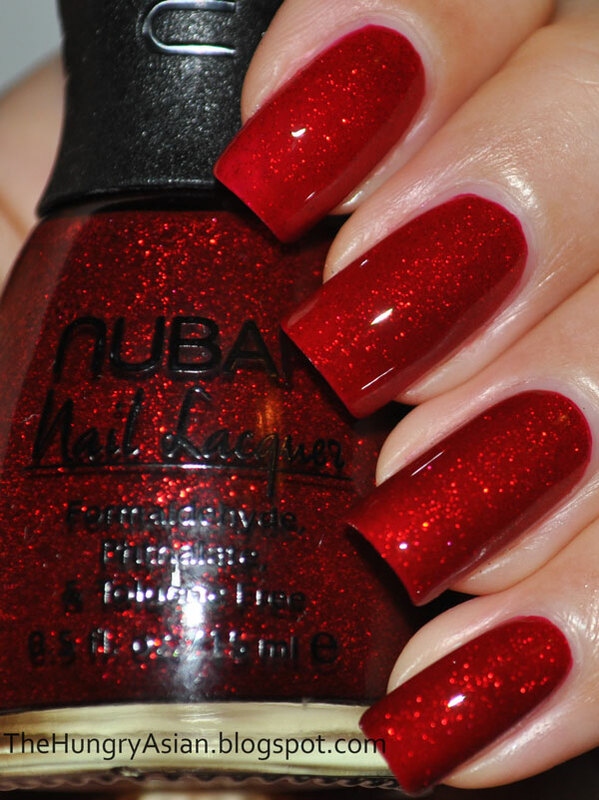 My favorites were Ruby Red Glitz, Nubar 2010 and Silver Glitter.